Rope-Over-Wire (ROW) anchors are galvanized steel cable covered with soft, flexible rope in technical kermantle construction. Eyes on each end are reinforced with steel thimbles and secured with double copper swages. Rated to 10,000 lbs. 6ft. length. 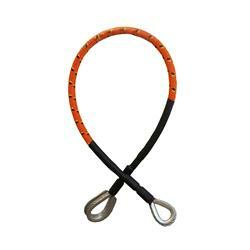 Jaco Aerospace and Industrial is your one stop resource for 3M(TM) and DEUS(TM) Rope-Over-Wire Anchor Choker DR-1232O-06, Orange, 6ft. Length, 1 ea and all of your 3M Products, Tapes, aerospace and industrial needs. SKU Marketplace Product Description: Rope-Over-Wire (ROW) anchors are galvanized steel cable covered with soft, flexible rope in technical kermantle construction. Eyes on each end are reinforced with steel thimbles and secured with double copper swages. Rated to 10,000 lbs. 6ft. length.